Chlorine can kill your seedling. Your seedling has been raised with non-chlorinated water. So please, don’t kill it with tap water. You can de-chlorinate tap water easily by letting it sit, open, for 24 hours at room temperature. 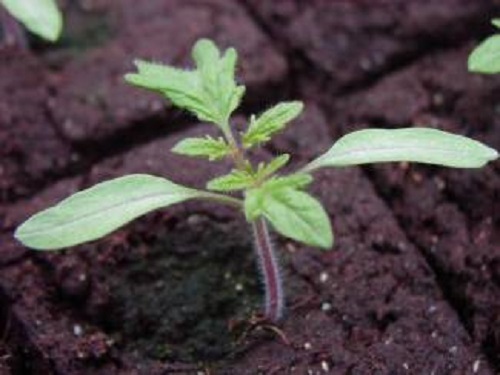 Tomatoes can be planted VERY deeply — up to their uppermost leaves — to encourage maximum root development. And all tomatoes, peppers and eggplants LOVE this side dressing: Grind up clean eggshells with used coffee grounds. This provides the magic formula that will keep the dreaded Blossom End Rot at bay. When planting, dig a $100 hole for a $10 plant. My cardinal rule. Your seedling has been grown in special organic potting soil. If you stick a 4″ seedling in a similar sized hole in a clay soil, guess what happens? It’s not pretty. Ideally plant on a cloudy, cooler day, or later in the day if it is hot and sunny. And water in very well. Keep an eye on it — any sign that it is stressed calls for immediate protective action. If thunderstorms are in the offing, cover it with a pot or cloche so it is not annihilated. I love offering you these seedlings. They have been coddled, yes. But the result, if introduced appropriately to your garden, will be a healthy, organic producer of fruit and flower. Don’t forget that you can easily clone your CherryGal tomatoes, peppers and eggplants for next year’s garden. I’ll teach you how in a subsequent post. This entry was posted in Garden, LuckyLike Dog Treats and tagged Garden, Organic by Cherry Gal. Bookmark the permalink.